Digicel celebrated its tenth anniversary in March and as a result they ran a promotion which allowed persons to trade in the companyâs older handsets for a Blackberry. 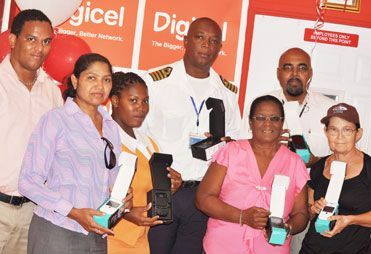 Marketing executive at Digicel Justin John said that persons were asked to bring in their old phones and once they were able to power up, those persons were placed in a random draw. He added that while not everyone who brought in a phone was rewarded, a large number of customers were chosen in the random draw and given Blackberry phones on Wednesday. âPersons brought phones that they had for 10 yearsâ, said John who added that the promotion was held to reward customers for their loyalty to the communications company.